The Etsy stock price hit an all-time low of $6.89 yesterday (Tuesday) – the latest indication shares of the handmade crafts marketplace are in for another rough year in 2016. Etsy Inc. (Nasdaq: ETSY) plunged 7.4% to its lowest level ever yesterday as early investors continued to sell shares following the expiration of its 270-day IPO lock-up on Monday. Lock-up periods are the stretches of time after a company goes public in which early investors, like founders and venture capitalists, can't sell their shares of the stock. The lock-ups prevent people with big stakes in the company from flooding the market with shares during the company's initial trading period. The lock-up's expiration let early investors breathe a sigh of relief as they sell their stakes in one of the worst-performing IPOs of 2015. Since skyrocketing 87.5% to $30 a share on its first day last April, the Etsy stock price has cratered 75.5%. That's significantly worse than the average 4% decline of all IPOs in 2015, according to Renaissance Capital, a manager of IPO-focused ETFs. Etsy stock's steady decline last year coincided with three terrible earnings reports. The company posted per-share losses of $0.84, $0.07, and $0.06 during its first three quarters, respectively. The Etsy stock price has also been obliterated by its newest and biggest competitor – Amazon.com Inc. (Nasdaq: AMZN). In October, Amazon successfully launched "Handmade" – an online marketplace for artisan goods. Forbes reported about 80,000 items from 5,000 sellers in 60 different countries went live on Handmade on its first day alone. Etsy clearly sees Handmade as the perfect threat. After all, Amazon has 278 million active users as of November 2015. That dwarfs Etsy's 21 million users. The first drawback is Etsy's surging operating expenses. They rose 81.4% in 2013 and 67.6% in 2014. Although the company is slowly cutting costs, its expenses hit $43.2 million in the third quarter. In fact, the company even admitted when it went public that it may never turn a profit. "We expect that our operating expenses will increase substantially as we hire additional employees and increase our marketing efforts," the Etsy IPO filing read. "We may not achieve or maintain profitability in the future." The second reason to avoid Etsy stock is the company's nonchalant attitude toward making money. This comes from the company's esteemed B Corp. certification. You see, B Lab is a nonprofit company that awards B Corp. certifications to companies exemplifying social and environmental responsibility. Some of Etsy's B Corp. initiatives include offering employees bikes for their commute and composting food waste. But these values jeopardize Etsy's ability to turn a profit. That's because the company prioritizes community well-being over the success of its business – something Wall Street is rarely exposed to. "There's a realization that corporations don't actually have to put short-term shareholder gain above all else," Edward Lawler, a business professor at the University of Southern California, told The New York Times before the Etsy IPO. "More people are saying: 'We have a right to ask more of our corporations, and they should not exist simply to generate profit.'" While that may be a benefit for customers, Etsy's 75% plunge clearly shows Wall Street has reacted negatively to this strategy. 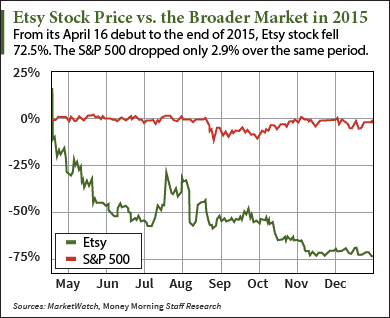 The Bottom Line: The Etsy stock price has endured non-stop volatility since its public debut nine months ago. With three consecutive quarterly losses and a careless attitude toward making a profit, Etsy stock is not a good investment. We recommend avoiding Etsy stock in 2016.